Manufacturer of a wide range of products which include neem oil, organic six, vermicompost for gardening and ka vita granular fertilizer. 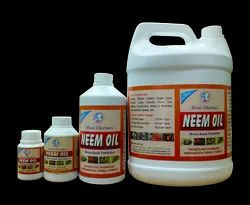 Neem Oil is a vegetable oil pressed from the fruits and seeds of neem (Azadirachta indica). The neem is very useful tree due to its medicinal and insecticidal properties and can be grown even under semi arid and subhumid conditions upto 700m above sea level. Neem seeds contain up to 45% oil, non-edible in nature. A neem seed contains about 47% oil. The oil is vegetable type oil composed primarily of glycerides (80 to 95%) and free fatty acids (4 to 20%). It is bio-degradable natural plant material. It has no phytotoxicity (damaging properties to the plant tissues) in lower ranges (like1 to 3%). Neem oil is generally light to dark brown, bitter and has a rather strong odour that is said to combine the odours of peanut and garlic. It comprises mainly triglycerides and large amounts of triterpenoid compounds, which are responsible for the bitter taste. It is hydrophobic in nature and in order to emulsify it in water for application purposes, it must be formulated with appropriate surfactants. Neem oil also contains steroids (campesterol, beta-sitosterol, stigmasterol) and many triterpenoids of which azadirachtin is the most well known and studied. The azadirachtin content of neem oil varies from 300ppm to over 2500ppm depending on the extraction technology and quality of the neem seeds crushed. GROWTH PROMOTORS LIQUID PACKED SIZE (100ML-5LITRE). 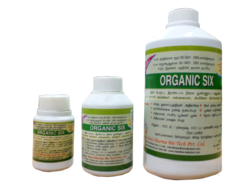 We are one of the leading manufacturer and supplier of Organic Six. we have successfully mastered the art of vermicomposting. This allow us to provide our clientele a comprehensive range of vermicompost based products that are produced using worm castings, bedding materials and organic wastes at various stages of decomposition. 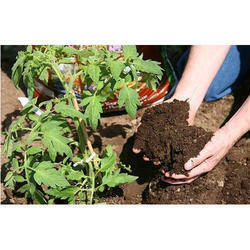 We are offering KA Vita Granular Fertilizer.